AUDIENCE: It does not make for light reading, but it will not be insurmountably dry to the motivated layman. If you’re feeling intimidated, just familiarize yourself with the high level contents, and read individual chapters as needed. REVIEW: Some of the articles are quite technical (e.g. the mtDNA study), so you might have to get the old biology dictionary out. But it’s well worth the effort, as it really gives you THE seminal articles from THE leading authors on each subject it tackles. Some articles reviews the current understanding of difficult issues like the history of dog domestication. Of course, as time goes by, more research is conducted, and the book will quickly become out of date. It will remain a classic collection of reviews nonetheless. I have found this book to be an invaluable reference when digging deep into a specific topic. It always has that ONE pivotal article that is still influencing researchers on that particular topic today. The sampling of topics did confound me a little, and some subjects received much more attention (e.g. evolutionary biology) than others (e.g. socialisation), with little in the way of a framework explaining these choices. 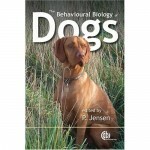 In short: I find it an invaluable resource if you’re serious about a career with dogs – be it as a trainer or a behaviourist. It comes back again and again in the reference section of books for the layman, so why not give yourself and treat and see what the fuss is about? Browse the Book Review archive. Genre: survey of peer-reviewed literature. Author: Jensen Per. Reading Level: Academic. Star: 3. Bookmark the permalink. Post a comment or leave a trackback: Trackback URL.